Ever since my mom passed away, two years ago, Day of the Dead has taken on a new significance for my family and me. Hope these Día de los Muertos ideas inspire you to celebrate with your families and in your World Language classrooms. My mother fought breast cancer valiantly for ten years, but her body just wore out. She was an amazing woman who gracefully raised three kids, including my very handicapped brother. She dealt with the many challenges that life brought her way with a positive attitude and kind spirit. Such strength and love! This is why we are all so eager for her spirit to return to us on November 2nd, Day of the Dead. I used to teach my students about Day of the Dead through a short video or a brief explanation, but this year, in honor of my mom, I decided to up my game and really embrace and celebrate the holiday with some extra pizzazz. 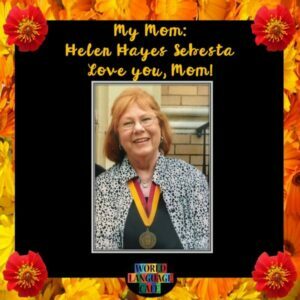 Also, in her honor (as she was a very giving person), I’ll be sharing my Day of the Dead Vocabulary and Secret Message Worksheet for you and your students at the end of this post. 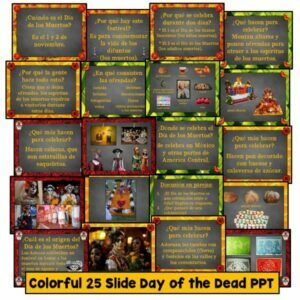 Creating a colorful PowerPoint presentation filled with visuals is a great way to illustrate the most important information about Day of the Dead. I created my own colorful borders using pictures from Pixabay.com and made my images pop by removing the background from certain pics. Did you know you can do this in PPT by clicking on the image, then on format and then on remove background? This is by far my favorite new PPT trick this year. See the examples below. The Dates: Nov. 1st, 2nd. Día de los Angelitos or Día de los Santos Inocentes, on November 1st, celebrates the little kids and babies who have passed. 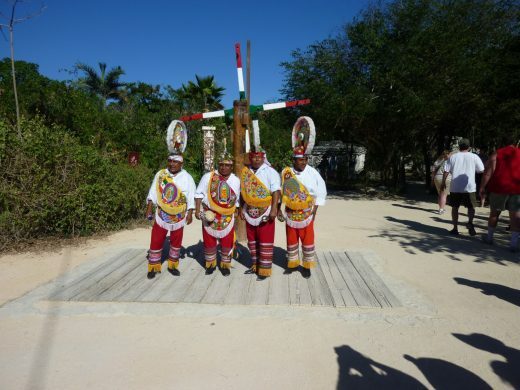 November 2nd or Día de los Muertos, celebrates the memories of the adults who have passed. Also, during this week, the monarch butterflies return to Michoacán, Mexico. Many people believe that these butterflies symbolize the returning of the spirits of the deceased. Where: Mexico, various parts of Central America and some small pockets of the United States. 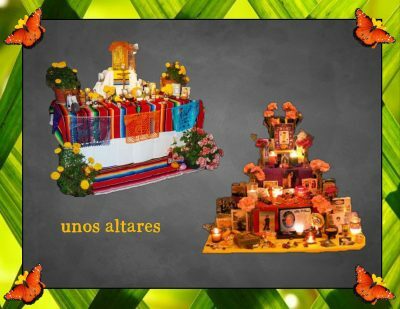 How Mexicans Celebrate: Building altars, decorating them with “ofrendas”: flowers, photos, meaningful objects, foods, candles, incense, etc. Preparing special foods and decorations to celebrate such as pan de muerto, sugar skulls, calacas (skeleton figurines), caretas (masks), and papel picado. Dressing up as the dead (like La Catrina – the Aztec goddess of death). Placing cempasúchiles (marigolds) on the graves and decorating tombs in the cemeteries. Why Mexicans Do This: They believe that the ofrendas will attract the spirits of the dead to come back to visit them. When the spirits visit, they want it to be a festive atmosphere, basically a big party so they can all spend the day together. How Mexicans Feel about the Holiday: Death is not feared in the Mexican culture, but is seen as part of the cycle of life. As Carlos Olmedo explains in the video link below, “For Mexicans, death was part of life. For us, it was like going from day to night so we didn’t feel something we were losing; it was just a step more.” Instead of being sad, Day of the Dead is a happy celebration, a joyous day to remember all the good memories from times past with your loved ones. In class, after giving a brief presentation and answering any questions, show these two video clips which I found. I love how they capture the essence of the day. After showing the videos, have a quick class discussion about what they learned and what they think about the holiday. 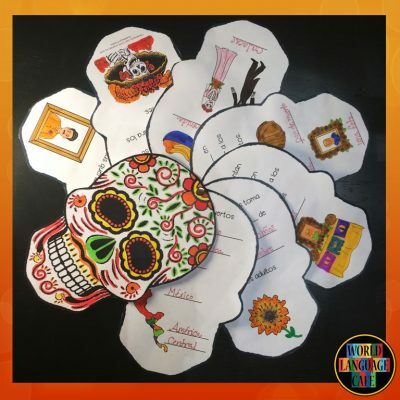 I love adding music to my classroom any chance I get, so I was so excited when I found the perfect song for Day of the Dead, “Ofrenda” by Pedro Guerra. I created a reading, a cloze activity, and some follow-up questions to go along with the song. Here’s the link to the song: Ofrenda. Be sure to test the YouTube song link on your computer at school because sometimes certain schools block YouTube. You can purchase it for 99 cents on Itunes if this is the case. I created Day of the Dead games and flashcards to help students learn the vocabulary from the day. Again, you can find images on Pixabay and remove the backgrounds. If you don’t have time to make them on your own (and I have to tell you that it’s pretty tricky to line them up correctly so that they will print back to back), skip this part and go straight to making crafts. 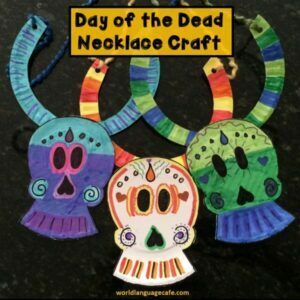 Ahh – Day of the Dead crafts – so many good ones to choose from. My new favorites, which are much easier than making sugar skulls (no fun to clean up after those), are marshmallow skulls and skull rocks. And for the little ones, I love making these skull necklaces out of paper plates – they wear these with pride. Mini skull booklets for grades 2-12 are a great craft for older students to write the information that they have learned about Day of the Dead. 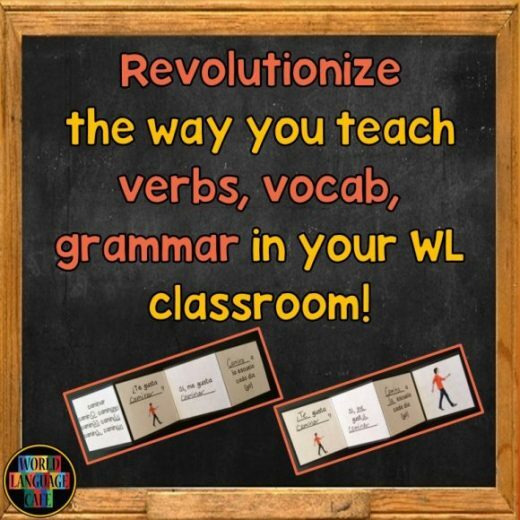 Multiple versions (fill in the blank, sentence starters, etc.) 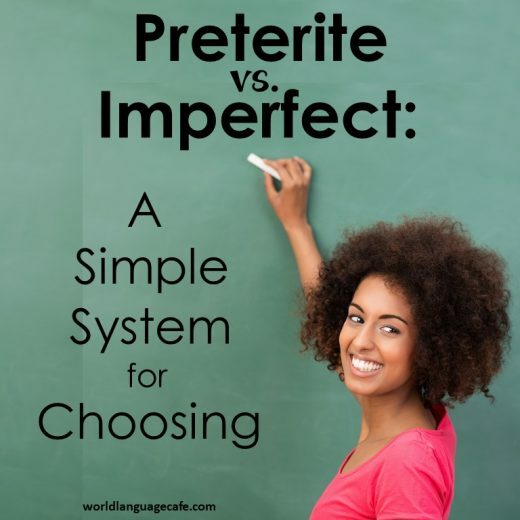 are available for a variety of levels or for differentiated learning. Don’t forget about Day of the Dead decorations! If you have time and energy, you can have your students create an altar in your classroom. Put boxes or crates on the table that you will be using to create tiers and then cover the tiers with serapes or plastic tablecloths. The students can make tissue paper flowers and papel picado. If they’d like to, have them bring in photographs of pets or family members who have passed and important objects that belonged to them. For extra credit, students can make special food for Day of the Dead, pan de muerto or other recipes that they can find. For recipe ideas, altar photos, and craft ideas, check out my Day of the Dead Pinterest Board. 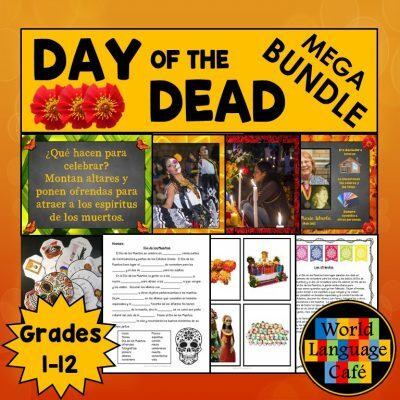 If you want to celebrate Day of the Dead, but don’t want to spend hours putting together a PowerPoint, creating song activities, making flashcards, etc., check out my Day of the Dead Bundle which has everything from this article and more. 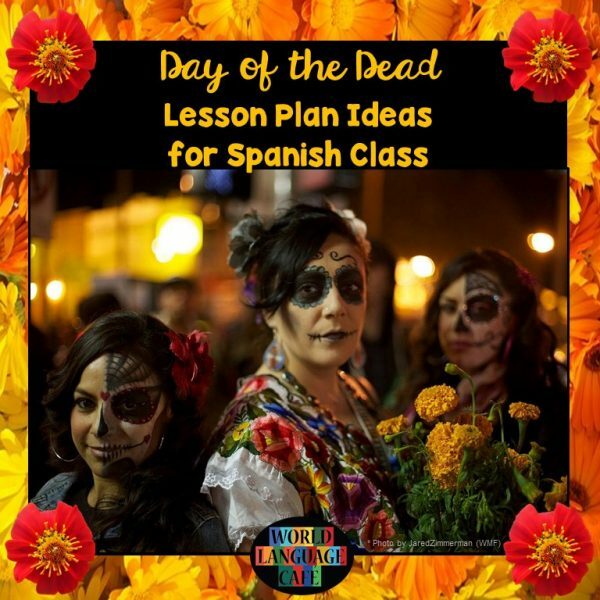 So easy to use – everything is ready to go and I’m telling you, this has enough Day of the Dead activities for your whole Spanish teaching career! Be sure to get your free Day of the Dead Vocabulary and Secret Message Worksheet. Sign up below to access it in my Free Resource Library (plus get lots of other goodies). Wishing all of you a wonderful Day of the Dead in Spanish class!